Documents, such as drawings, memos and specifications, form an essential function in the design and construction industry. Throughout the lifecycle of a built asset, starting from an initial design idea, right through to a final built form and its ongoing management, thousands, even millions of documents can be used to convey various forms of information to a range of interested parties. In many ways, therefore, the success of a design, or construction-based company, relies upon an understanding of the use of documents, as well as the technologies and techniques that are used to create them. 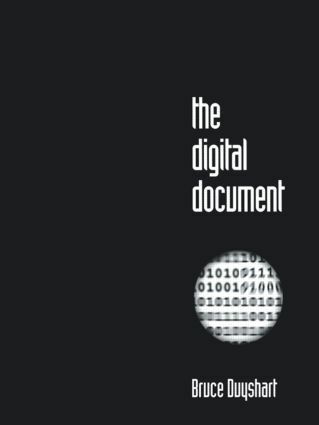 The Digital Document is an essential reference for the architect, engineer or design professional that wants to find out more about effective communication in the digital workplace. Bruce Duyshart is an IT Project Manager with Lend Lease Corporation and specialises in the development and implementation of digital media and information management technologies on design and construction projects. He holds a Masters degree in Architecture and is also an academic associate of the Faculty of Architecture, Building and Planning at the University of Melbourne. He has written numerous papers on emerging technologies in the architecture, engineering and construction industry, and has developed Internet web sites for the Royal Australian Institute of Architects and Architecture Media. William J. Mitchell, Professor of Architecture and Media Arts and Sciences and Dean of the School of Architecture and Planning at the Massachusetts Institute of Technology. Preface; Acknowledgements; A New Medium for Documents; The Document; Document use in the Construction Industry; The Digital Document Environment; Digital Data Types; Digital Document Types; Applying Digital Documents; Professional Opportunities; Glossary; Internet Resources; Index; Colophon.